Donors generously respond to fund office equipment and transportation for the newly launched field team. Lifewater program manager, San Veasna, is much more mobile than he used to be. Leading the team of 7 Lifewater staff out of the Svay Leu field office in the Siem Reap Province of Cambodia, Veasna knows that reaching rural Cambodian households with health messages is hard work. There’s essential equipment that the team needs such as smart phones (to upload data into our data monitoring system), data plans, and even an office to work from. And then there’s the journey. Traversing miles over dirt roads that, in the dry season, kick up so much dust that eye wear and scarves are necessary accessories in order to see and breathe. In the rainy season there’s a different challenge as Lifewater staff must trek through thick patches of mud that are nearly impassable by car. The solution was simple – something small, light, inexpensive, and fast – motorbikes. In July, the need for motorbikes as well as other necessary office equipment was shared with the world and donors generously responded! 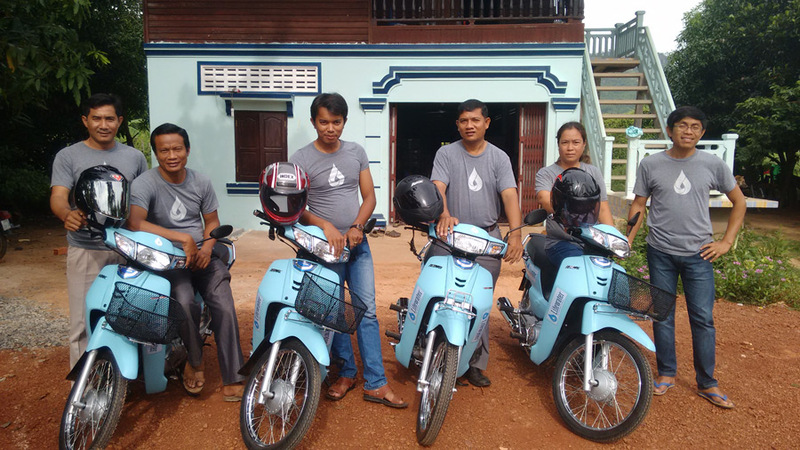 In fact, twenty three donors contributed to give beyond the initial goal of $6000 and were able to provide the Svay Lea Field Office with the final two motorbikes needed plus the additional mobile phones, data plans, and rent money necessary to start the work. On behalf of the vulnerable children and families that are already being impacted by your generosity – THANK YOU. This life-saving work could not happen without your generosity. Stay up to date on changes that are happening in Svay Lea and see the families your gifts are impacting by by visiting our Cambodia Program Page.